All the way up to my sophomore year of college, my family and I made sure to visit Korea at least once a year. Then for five years I was unable to visit my home country due to school and work. Recently, I ended up having a year off, so naturally I decided to live and work in Korea for a few months. While planning my Korea trip, I decided to throw in a Japan trip because I didn't know when else I would have such a good opportunity to visit the country. I'm going to chronicle some of my experiences during my Japan trip in a series of blogposts. Hopefully the posts won't be too long, and I'll throw in some photos here and there to keep it at least a little interesting (click thumbnails for higher resolutions)! If you want just the pictures they're in a convenient flickr set. Anyways, on with part 1. My afternoon flight to Japan was delayed twice thanks to Typhoon Talas, but the trip itself was uneventful. The seat next to me was empty, and I fell into a comfortable sleep almost immediately after the plane took off. I woke up in time for the on-board meal, and I managed to enjoy half of a random Korean comedy movie before landing at Kansai International Airport. The sun was already setting, but it was still disgustingly humid and warm. After an irritatingly long passport check, I was soon on my way to Kyoto. 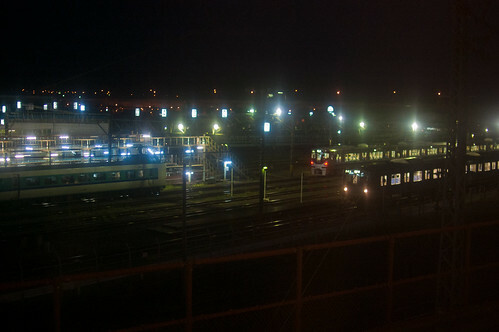 My host, Katsuya, picked me up at the Nishioji station. We grabbed some food, then went to the grocery store to grab some food for the next few days before returning to his place. Katsuya's place was exceptionally clean and very spacious. The guy's also incredibly nice and polite. He mentioned that the guest after me is going to be the last guest for a while due to work circumstances, but if he is back in business the next time you need a place to stay in Kyoto, I highly recommend it. I should note that I didn't make my Kyoto sightseeing itinerary. A few days before coming to Japan, I met a fellow traveler on the subway in Korea. 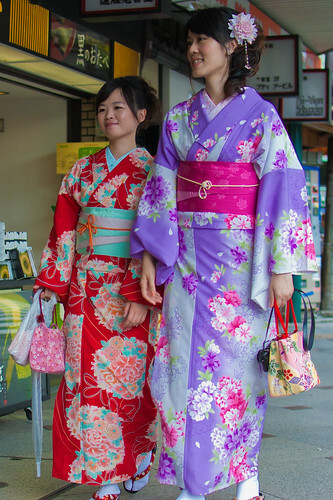 When I mentioned that I was going to Kyoto for a few days, she told me that she could forward me a nice Kyoto itinerary a friend had made for her. 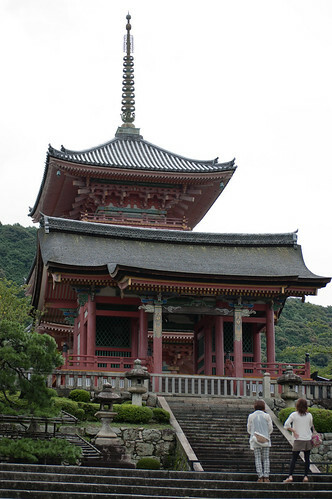 (Someone else's) plans in hand, I set off early the next day to Kiyomizu temple and its surrounding area. The day was hot, humid, and rainy. Given the weather I decided to wear shorts, which ended up being the biggest mistake ever. By the end of the day I had 7 mosquito bites on my legs (and one on my left arm, and one on my bald head). One of them got pretty bad and exploded. It looks pretty gross, even now. Anyways. The temples were nice and all, but I wasn't exactly visiting in-season, so I wasn't swept away by them, either. No cherry blossoms, no red autumn leaves, no snow. But thanks to that it wasn't too crowded, and I managed to enjoy my temples in peace and quiet. In the area, I ended up going to Kiyomizu temple, Kodaiji temple, Chion-in temple, Yasaka shrine, and Marayuma park. They're going to eat you!! 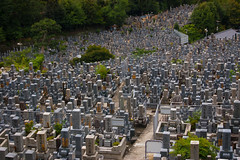 Somewhere in there I got lost and stumbled into what I later found out to be the Higashi Otani cemetery. 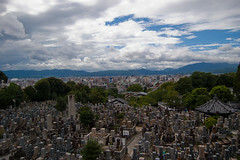 A bit off the beaten track according to my host, but the number of tombstones and the view from the top of the cemetery were both breathtaking. When I was done with the temples, parks, and cemeteries, I ended up in Gion. Full of souvenir shops and the Nishiki Food Market close by, the place was teeming with Japanese tourists. After wandering through Gion and its shops for a bit, I headed towards another part of Kyoto to see Nijo-jo castle, Kinakakuji temple, and the Kyoto Manga Museum (I do like my manga!). 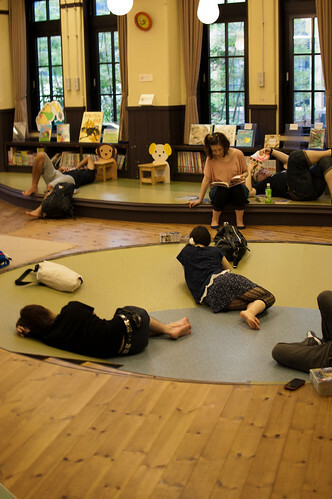 The museum ended up being more of a manga library with a very high entry fee, with only a few exhibitions catering towards non-Japanese speakers. For those interested in manga and with the ability to read Japanese, however, the place is probably a gold mine. Lots of manga, old and new, were available for reading. They have a small section for mangas translated into all sorts of different languages on the first floor, but its selection pales in comparison to the Japanese selection, which dates back all the way to the 60's. 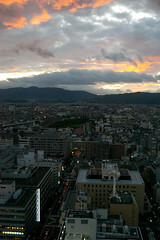 I ended the (pretty long) day at Kyoto tower. 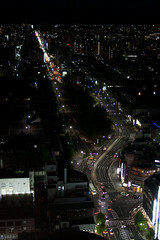 After taking some photos from the observation deck, I decided to grab a drink at the 'Kuu' bar/restaurant a level below. When I asked the only other guy sitting at the bar if he was a local (in English) he jerked upright and exclaimed 'I AM J-J-J-JAPANESE.' I guess he answered my question. The guy (whose name I can't remember for the life of me) wasn't Kyoto-born, but he was living there now to study Buddhism and the area's temples. He stuttered when speaking English, but he had a better grasp of the language then most of the other locals I've tried speaking to. He was a jovial guy who kept on saying that the Japanese were 'f-f-f-f-fools that cannot speak e-e-english.' Fun times. After parting with my stuttering drinking buddy I headed back home. Despite the numerous mosquito bites making my legs itch like hell, I managed to fall asleep pretty quickly after the long first day. Such an interesting blog. I can't wait for part 2, but I also have 2 questions. #1 Why did you take a picture of a guy sleeping in what I assume is a park? #2 What's up with the graveyards I thought that in the east they didn't have any graveyards because all people are suppose to get cremated after their death? #3 What time of the day are the night pics taken at? I always imagined that streets in Japan were way more crowded with cars. when the people get cremated you still need a grave for the ash. #1 That was at Maruyama Park. I was sitting down for a rest myself and the seat orientation basically pointed straight at the guy. I couldn't help but take a picture because he looked so content napping there. #3 The pictures were taken between 7:30PM and 9PM. Cool pics, thanks for sharing. That cemetery is surreal. I couldn't find a wikipedia page for it. How unusual is it for there to be such a high concentration of elaborate tombstones like that? Edit: also what do all those little signs by the trees say? Since when do geese let you cuddle them? That's so cute Or are they ducks? ... feeling a little Nal_Ra on the matter. Anyways, hope you had fun! Nice little blog, I wish you had gone to Ginkakuji instead of Kinkakuji but oh well! Looking forward to more, enjoy your stay. haha i felt exactly the same, I kept referring to them as ducks the other day. It's too bad they were out of Yebisu. Hopefully next time! It's called "The Glass Square", in the basement of my work building. Cambium your last two posts are pretty creepy. I mean wanting for people to "officially meet you in the basement of your building" sounds kinda scary. Man, Japan is beautiful. From the temples to the cemeteries to even the cities (coming from a person who despises most big cities), everything looks awesome. Oh and those heron are pretty hilarious haha. I love travel blogs! (especially Asian countries) Too bad there wasn't any cherry blossoms or anything. I've heard those are fantastic. Loved the photos also. That older man sleeping at the park bench.. really nice picture. in the basement of the building I work in. awesome pictures, i really like the color.